Free woodworking plans and projects that start with the letter N. Napkin Holders, Nativity Sheds, Nights Stands and a few others. Many of the more commmon woodworking plans have branched out into their own categories. Name Puzzle for Children free project. For this name puzzle project you will need a jigsaw or scroll saw and a router. For the wood, scrap wood is perfect. Follow along at the link to see one being made. How to Build a Nail Polish Carousel. 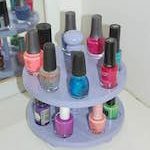 Keep your nail polish organized and within easy reach by building this nail polish carousel using these free instructions. How to Make a Native American Artwork. This free tutorial shows you how to build this Native American art and how it could be used. How to Make a Needlepoint Stand. This needlepoint stand will make a cross-stichers life a bit easier. Being able to clamp the hoop in the stand means that they can use both hands for doing the cross stitching. One 8 foot maple board and some hardware did the trick. You need Adobe SVG View software to view the plan diagrams.